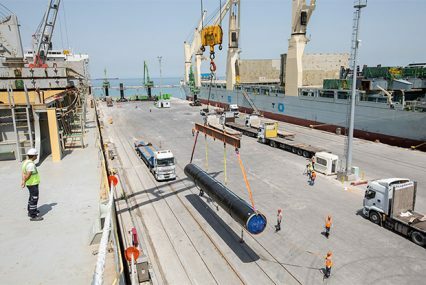 The Asian Infrastructure Investment Bank (AIIB) and World Bank rounded off 2016 with huge loans to the Trans-Anatolian gas pipeline (TANAP) project, part of the gas corridor connecting Azerbaijan with Europe. In the days before Christmas, the AIIB gave its approval to a US$600mn loan to be used in the project’s construction, while the World Bank pledged US$800mn. The 1,850km pipeline will be operated by the Azerbaijan Southern Gas Corridor (SGC), the main borrower – although 50% of the World Bank’s portion will go to the Turkish state-owned energy company BOTAS, which holds a 30% stake in the project. This portion is guaranteed by the Turkish government. The TANAP will travel through Turkey and eventually connect to the planned Trans-Adriatic Pipeline (TAP), bringing natural gas to Europe via Greece, Albania and Italy. It will have a total cost of US$11.7bn. There will be substantial equity finance, but around US$4bn is expected to come in external debt. A big portion of the finance will likely come from multilateral lenders, with the European development banks expected to come into play soon. The European Commission has billed TANAP as the “biggest infrastructure project of our times”, clearly looking to Azerbaijan’s Shaz Deniz II gas-field in the Caspian Sea as a means of replacing the energy supply lost to sanctions the EU placed on Russia. The European Bank for Reconstruction and Development (EBRD) is expected to provide a syndicated loan of €1.5bn to TAP and another large loan to TANAP. The European Investment Bank (EIB) and the Multilateral Investment Guarantee Agency (Miga) are likely to be involved too. The AIIB’s debt is guaranteed by the Azeri government, which through its State Oil Company of Azerbaijan (SOCAR) holds a 58% share in the project. The loans take the AIIB’s book to more than US$1.7bn in its first year of operation. “The approval of TANAP, which involves a number of other multilateral and private sector players, demonstrates the bank’s capacity to assess and provide loans in even the most complex of cases. “This crucial upgrade of energy infrastructure between Asia and Europe will further strengthen the economy of Azerbaijan while underpinning energy security in Turkey, as well as several countries in southern Europe,” says DJ Pandian, the AIIB’s chief investment officer.